This little weevil, whose larvae are more harmful than the adult insect, attacks a large number of flowering plants, such as begonia, fuchsia, busy lizzy [Impatiens], pelargonium and primula. The natural control is a parasitic eelworm (nematode) which is drenched onto the soil and plant roots. These feed on the leaves, stems and flowers of ornamental plants, vegetables and fruits. They are also known as greenfly or black fly but the insects can be pink, cream or mottled. Broad beans and elder bushes are prone to black fly attack. Symptoms � sap-feeding insects infesting plants especially on shoot tips, flower buds and leaf undersides. The foliage may be sticky with honeydew that aphids excrete and a black sooty mould often develops on the honeydew. Control � pick aphids off plants by hand and nip out the affected shoot tips as soon as aphids appear. Natural enemies of aphids are ladybirds, parasitic wasps and larvae of lacewing and hoverfly. Spray plants with pyrethrum, rotenone, fatty acids, plant and fish oils or plant extracts. For higher levels of control use bifenthrin or imidacloprid. These are mainly a problem in greenhouses or for house plants. Symptoms � pale mottling on the leaves and in bad infestations, fine webs around the leaf and shoot tips. Control � keep the air humidity high by damping down, spraying plants with water and placing houseplants on damp pea gravel. Destroy affected leaves and shoots. 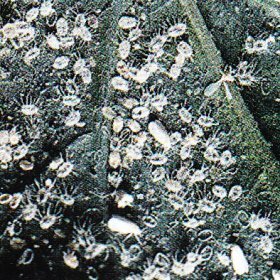 Predatory mite Phytoseiulus persimillis feeds on the eggs or spray with bifenthrin. Mainly affect greenhouse plants, especially fuchsias and tomatoes and brassicas outdoors in summer and autumn. Symptoms � clouds of small, white-winged insects fly up from the leaf undersides when touched. Leaves become sticky and have black sooty mould. Control � use biological control, sticky traps or spray with bifenthrin, plant extracts, plant oils or fatty acids. Grubs attack the roots of almost any young plant and are also fond of the tubers of begonia and cyclamen. Plants in pots are particularly at risk. Symptoms � plants turn yellow and wilt, by which time it’s probably too late to save them. 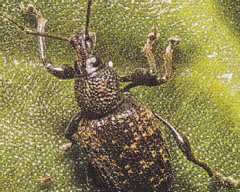 Control � pick off and destroy any newly hatched adult vine weevils and look for notches bitten out of the sides of leaves. Sprinkle a thick layer of grit around plants at risk and don’t leave old compost lying around in pots and baskets. To kill the grubs in containers , water pathogenic nematode Heterorhabditis megidis into the potting compost or apply a pesticide that contains imidacloprid. This is available as a slow release formulation pre-mixed with a peat compost, sold as Levington Plant Protection Compost. These will attack any soft, lush plant. 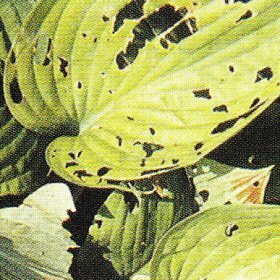 Hostas are a favourite although hairy plants are usually safe. Symptoms � slugs tend to attack plants close to the ground and eat all parts of the leaves and even tubers underground. Snails climb so look out for trails and nibbled leaves even on plants in pots. Control � place barriers such as prickly leaves or really sharp grit around plants or a ring of petroleum jelly around the top of pots. Collect slugs and snails by hand and dispose of them. A nematode Phasmarhabditis hermaphrodita works specifically against slugs and is simply watered into the ground. Use slug pellets sparingly. You can also try beer traps with a jam jar filled partly with beer sunk into the soil near vulnerable plants and empty it regularly. This is a fungal disease most prevalent in wet weather as it’s spread by water droplets. If left untreated, susceptible plants can lose their leaves. Symptoms � black patches appear on rose leaves and stems and leaves fall prematurely. Control � remove infected and fallen leaves promptly and regularly. Hard prune infected bushes in spring and burn the prunings. Spray with penconazole, flutriafol or myclobutanil, alternated with mancozeb to prevent the fungus from developing resistance to the fungicides. Caused by a range of closely related fungal species. Some mildews spread to cultivated plants from closely related weed hosts so weed control is an important part in limiting disease. Many garden plants are affected both woody and herbaceous, particularly apple trees, roses, sweet peas and those growing in containers. Vegetable foliage is also prone including beetroot, parsnip and spinach. Symptoms � a dry whitish powder coating leaves, shoots, tips and flowers is especially visible in summer. Other symptoms include stunted and distorted growth and reduced flowering. � Keep plants well watered so they are not dry at the roots. � Mulch to preserve soil moisture. � Avoid high-nitrogen fertilisers as these encourage soft, sappy growth that fungi is more attracted to. We would recommend not using chemical spray pesticides on your planters or window boxes. With a small scale garden removing the pests by hand or washing with soapy water can be as effective. It is sometimes better cut off the affected areas of the plant and throw them away. Remember, not all insects are pests some are useful pollinators and beneficial to wildlife. Bright yellow or white streaks can be seen on leaves. They are unsightly but do not actually damage the plant. 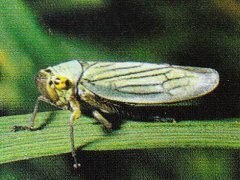 During the nymphal stage, froghoppers hide inside a froth known as cuckoo spit. This pest belongs to several species of sap-sucking insect. Plants affected: Busy lizzy, chrysanthemum, foxglove (Digitalis), marigold (Tagetes), primrose, sage (Salvia), tobacco plant, verbena. Treatment : Pick off these insects by hand. If there are vast colonies, spray using an insecticide with a base of pyrethrins or bifrenthrin. 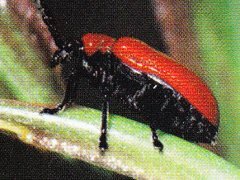 Symptoms: Bright red beetles with black heads and long bodies produce dark-colouredarvae in early summer. Both adults and larvae rapidly devour all parts of lily plants and must be controlled quickly. Treatment: Deter the beetles from climbing up the lily stems by coating them in vaseline. Remove from the leaves and destroy the adults and larvae. Alternatively, spray with an approved treatment. Symptoms: Tiny soft-bodied insects can be seen on the undersides of leaves and at leaf axils (where the leaf stalk joins the stem). 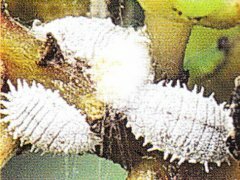 Fluffy white wax is excreted to cover the mealy bugs and their eggs, so the foliage becomes sticky. Plants affected: Plants in greenhouses, such as abutilon (when they are known as Hesperides lice). pelargonium, fuchsia (known as floury mealy bug). Treatment Introduce: Cryptolaemus montrouzierei, a predatory ladybird, on large plants and Hypoaspis miles, a predatory mite, on small ones.